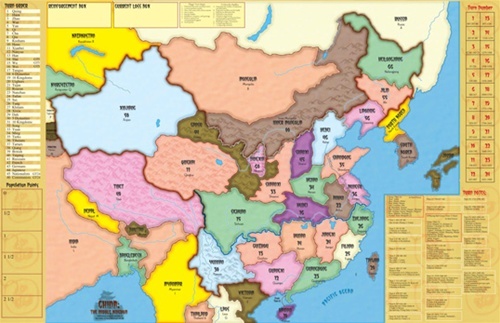 China: The Middle Kingdom covers the full scope of Chinese history, from its beginnings as a collection of warring feudal states, to the current cold war between China and Taiwan. In this epic game based on the classic Avalon Hill Britannia system, four players each control several factions simultaneously, with each faction having their own objectives and situations, such as conquering certain provinces. The winner is the player who scores the most points by the end of the game. This breathtaking game unfolds on an illustrated map of China with 456 counters, covering 50 separate countries and peoples, including all of the major dynasties of Chinese history, the arrival of the European powers, both World Wars and the Japanese invasion, right up to the end of the civil war between the Communists and the Nationalists. 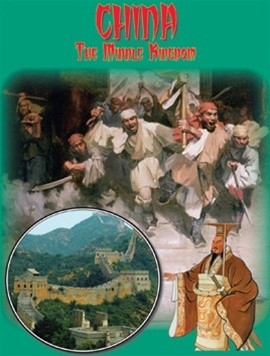 The game occurs over 24 turns, starting from 403 BC, during the “Warring States” period as China begins to rise from its feudal age. The game has two shorter campaign scenarios covering the first half and second half of the full campaign game. Contents: 50 country cards, 456 markers, rule book, 22 x 34 inch mapsheet, 2 inch box.